A deeper and more intimate relationship with God is closer than you think. He demonstrates how each step is part of both a linear path and a cycle leading to deeper levels of faith. Accessible and clear, concise and profound, no matter where you are in your journey, What's Next? is the guide you need to find your way and discover the joy that comes walking the road of richer faith. About "What's Next? 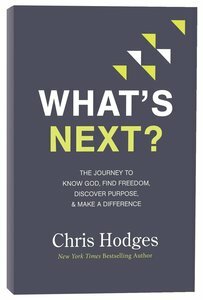 : The Journey to Know God, Find Freedom, Discover Purpose and Make a Difference"
In Now What?, Chris Hodges reveals the four steps to spiritual maturity: knowing God, finding freedom, discovering purpose, and making a difference. He shows how they are part of both a linear path and a cycle that Christians continue returning to at increasingly deeper levels as they grow. Accessible and clear, concise and profound, Now What? is a trail guide leading to a deeper and more intimate relationship with the Father and the joy that comes from the journey. Chris Hodges is the founding and senior pastor of Church of the Highlands. Under his leadership, Church of the Highlands offers fifty-four worship services each weekend at fifteen campuses with over 43,000 people attending weekly. He also co-founded the Association of Related Churches, launched a coaching network called GROW, and serves as Chancellor of The Highlands College, an accredited two-year ministry training college. Chris and his wife, Tammy, have five children and live in Birmingham, Alabama.